I’ve been running a little ‘gardening gloves boot camp’ here at May Dreams Gardens, putting a new pair of gloves through various drills and exercises in the garden to see how well they hold up. We’ll call this pair of gloves “Ethel” since they came here compliments of Ethel Gloves. Right off, Ethel looked fancier than any pair of gloves I’ve ever tried. Oh my, such a fancy package! 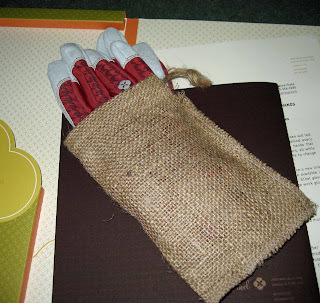 She was in a little burlap bag, in the pocket of a nice folder, inside a cardboard sleeve. But, as with all new “recruits” here at May Dreams Gardens’ gardening gloves boot camp, all Ethel’s finery was quickly cast aside and I immediately started putting her through various drills and exercises. First, the fit. I put Ethel on my hands and was pleased with the fit. No gaps or wrinkles and no major restriction in hand motion. But wearing a pretty pair of gloves to meander around the garden is one thing, working in them is quite another. So we (me and the new gloves, "Ethel") got right to work transplanting several new perennials I had picked up on the way home from work that day. Usually, if I try to wear gloves while transplanting, at about the point when I am getting the plant out of the pot, I end up taking the gloves off and casting them aside. But not with Ethel! She handled this task quite well, staying on my hands the whole time, though she did get a might dirty. On to the next drill, weeding. How would she do with tough thistle plants? Or some small weeds, which is where most gloves fail. She did a fine job. I didn’t once feel the urge to tear the gloves off my hands while weeding and I was able to grasp the weeds to pull them out, both big weeds and small weeds. Next, I tried deadheading. No problems here. I found it was very easy to cut back some spent blooms while wearing these gloves. Maybe I could break her with watering? So I wore Ethel while watering all the container plants, and even though she got wet, she hung in there. I got wet, too, but that’s another story for another post. Now that Ethel was dirty, wet and stained, I decide she was nearly ready to move on to the last exercise at gardening gloves boot camp. But first, she had to survive the washing machine. So I tossed her in the washer with a load of jeans and she came out as good as new, still the same size, and ready for the last exercise, hoeing. I have absolutely no use for a pair of gardening gloves that isn’t up to the task of hoeing in the vegetable garden. So early one morning, I put Ethel on my hands and picked up a hoe for this final test. I then spent the morning hoeing and weeding in the garden, and I kept the gloves on the entire time. As the temperatures warmed up, I did notice my hands were getting a little warm, but this would happen with any gloves worn on a hot day. Ethel, having completed this final exercise quite well, graduated from my gardening gloves boot camp with high marks and a promotion to the top of the stack of gloves I use in the garden. The one test I couldn’t perform in a few days was a longevity test. How long will Ethel gloves last under normal gardening condition? I don’t know, but I like these gloves well enough to wear them often enough that I’ll find out at some point. I really do like these gloves. Would you like to try a pair of Ethel gloves for yourself? You can enter a contest here to win a free pair of these women’s gardening gloves. Just visit the Ethel Gloves website to decide which style you like best and then leave a comment on this post indicating your preference by the deadline of Friday, June 27, 2008, 5:00 PM EDT. The winner will be determined by a random number generator set to the number of comments received. 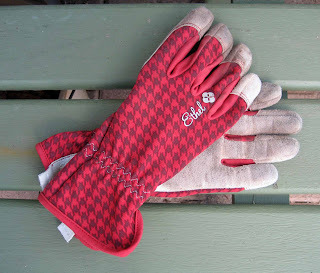 If you don’t win and think you might still like to try to garden with Ethel gloves, you can enter a code of ‘maydreams’ on their web site to get 10% off until July 22, 2008. Ethel gloves keep hands dirt free. Leave a comment to win some for free. Use MayDreams, get 10% off there. In your garden and everywhere. Ethel is a beauty, in my garden she would do double duty. I would be happy to have a pair to wear. Left,right, left right left. I'm still searching for a pair of gloves I really like. Ethel looks like a good candidate. Jubilee would make me jubilant, I'm sure. Oh the Jubilee gloves are gorgeous - and it sounds like these gloves are quite glorious at actually holding up to hard garden work - just kind of thing I need - my current gloves are cute but they are loose fitting and bits of dirt and mulch always find their way to my finger tips and they gotta come off! :) Ethel sounds like the perfect garden companion. Looks like the Jubilee Ethel is winning the popularity vote, and add mine to it. It is gorgeous, and if you endorse it, I do believe it must be good. Yep, Jubilee it is. Sounds like a pair of gloves I could actually get some use out of. I've never been too fond of gloves while gardening. But if you were able to put those gloves through your bootcamp and they passed with flying colors I would be willing to give gloves another chance. I can just see you in boring meetings coming up with this stuff. Love the chant at the end especially. I've got to vote for "Jubilee" also, but "Gala" is pretty nice too. How are these gloves for pruning things with thorns? That's the kind of glove I need. I don't actually wear gloves that often--to the detriment of my fingernails--but I really like the "jubilee". Oooh...I will defy the trend and say that "Rendezvous" is my favorite. They all are gorgeous, though! I too have a problem selecting garden gloves. They are either too flimsy, allow thorns to stick me or not felixible enough to so garden work. Your tests seem to pass these requirements. I love the Gala. Ethel sounds like a nice glove. But what about Fred? Is there a men's version? I usually just buy cheap gloves and then throw them away when they're worn out. But these look fantastic! I may just have to break down and buy a pair. How did they work on pulling out thistles or working around roses? It's hard to pick among the styles, but apparently I'm a conformist--Jubilee would be my pick, too. Love the Jubilee too, I always wear gloves, I go through at least 2 pairs per year. Wouldn't it be nice to have a pair that would last. I have brought home four pairs of gloves, thinking they were the "right" ones and they never even make it out of the gardening shed. Once I've used them a couple of times I prefer to go back to my bare hands. I would love to try a pair of Ethels and see if finally I might be able to keep my fingernails a little cleaner. Oh, I love Jubilee as well. I was looking for more gardeners to blog with and came upon your contest. My gardening gloves with the missing pointer finger tip (rock incident, don't ask) thinks this is fate. I've never won anything and yet I'll give it a go and say if I am chosen, I choose "gala." Jubilee is my favorite, but I am so hard on my hands (and gloves) in the garden, "Gala" looks like they could hold up. Thanks for doing this too. I'll be doing my first blog contest next month and will be spreading some book love. I am assuming all the gloves have the same features, and the only difference is in appearance. I like Jubilee the best. I am planning on ordering the compostor you recommended and it looks like I shall be checking out gloves...now, we need a new mattress any recommendations! Put me down for Jubilee! Thanks! I like the signature style although all are very nice. Never heard of these gloves before. Would love a pair! I am a definite glove wearer and these look great! I think if I had to choose, I like the Expression. Thanks for holding the drawing. I was just going to make a post asking about people's favorite gloves. I hope these pass the longevity test. In case I don't win the Jubilee pair I'd like, could you post about how well they hold up? I'm going through gloves like water lately. Thanks for the information. And one small comment: any way to get the gloves without Ethel on them? Speaking of BOOT camp . . . I have to garden with a "boot" as I have a permanent disability that makes it part of my gardening gear. Therefore my hands have to work extra hard. That's why I would love to put some Ethel gloves to a special BOOT camp of my own. One in which my hands do additional work of a third limb. It's super hard in the durability department. I'm thinking that I would love to have a pair of Rendezvous come give me a "leg up" with some real hard HANDiwork in my garden. They even look stylish enough to wear while power walking with crutches. I'd love to be given a pair to test to some especially high standards. Because if they can HANDle it; I could think of a lot of people to recommend them to. Oh I like those "Expression" gloves. I like the gloves I use now but I may be needing a new pair since I left them out in the rain. Jubilee......and if I don't win, I know what I want for Christmas if the right person gets my name! Love those gloves, especailly the signature. I just might have to order a pair of the signature gloves if I don't win your contest. Thanks for trying them out for us! I prefer the Gala Style gloves. If I don't win I will definitely have to order me a pair. This is a pretty glowing review. You've piqued the curiosity of this glove skeptic. I simply detest wearing gloves in the garden. I can do it when moving rocks or digging trenches and even sometimes when sifting mulch. But to find a pair of gloves that I could use when transplanting...that would be special. I think I like the Rendevouz. In medium. These gloves look awesome. It would be wonderful to find some that fit comfortably and are tough enough to handle anything. I know if they pass your tests, they are great. I like the Gala. Wow, those Gala gloves are cool.I have ruined several pairs of ski gloves by using them to garden in winter. The Gala gloves are cool enough to wear as gardening gloves and winter gloves. Jubilee's the one for me. Make them large. Thank you, Sarge. Oooh, much as I try to resist marketing that's targeted right at me, it's hard not to want these! I'm agreeing with the crowd-- definitely the Jubilee. I like the Rendezvous, please and thank you! I really would love to "rendevous" with a pair of these beauties! Im sure they would love to spend some time with me as well. i have Carhaart gloves I bought in West Texas, and they are great and hard wearing gloves as well as reminding me, gardening in rainy London, of one of my favourite holidays ever. Sounds like a wonderful pair of gloves. They are so stylish too. I would love to have a pair. I will chose Jubilee and in case of size I'm a small. I'll be sure to bookmark their webpage and buy when I have some money. I'm so sporadic about wearing gloves, for the reasons you mention in this post. These look like great gloves.